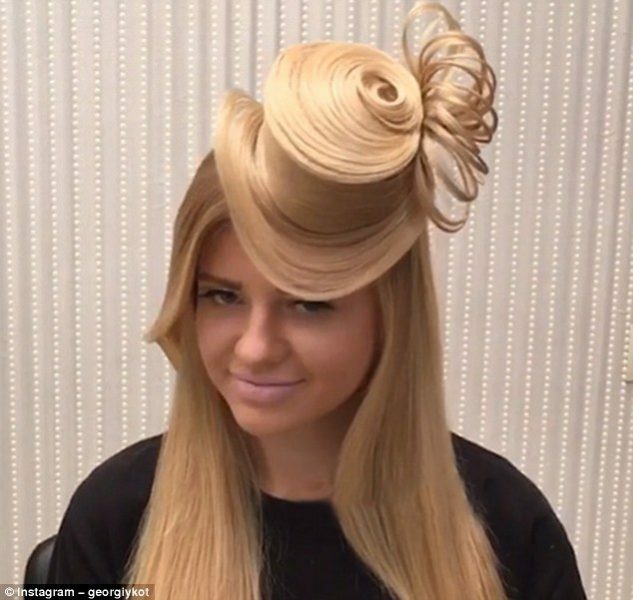 The look has been created by Georgy Kot, a well-known stylist in Russia who is famous for his intricate, sculpture-like hairstyles and boasts an army of 623,000 devoted fans on Instagram. Some of his latest offerings include gravity-defying ponytails, sky-high beehvies and old Hollywood-style mermaid waves. In the 30-second clip – edited into a timelapse for brevity – he shares a mini-tutorial for making a mini top-hat with fascinator out of hair, and the result is almost good enough for a day at the races. By wrapping a section of hair neatly around the messy bun, it gives the illusion of the crown of a top hat Russian stylist Georgy is known for his daring styles, from mermaid waves to sky-high ponytails. Georgy begins by drawing a section of the model’s long, blonde locks into a ponytail. He then backcombs that section into a messy bun, before wrapping a wide strand around it to create a bobbin-shaped wheel. Next, he teases a section around its base to form a wide brim, adding in smaller strands to create the appearance of feathers, and securing with clips.